SGD 43-A DK+ is a development kit for the SGD 43-A display. The kit includes all you need to begin: an SGD 43-A, a development board and a USB cable. 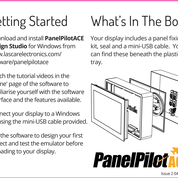 The development board itself provides switches, dials, LEDs and screw terminal connections to quickly connect to and test all of the input/output functionality of the PanelPilotACE display. The development kit SGD 43-A-DK+ is the best choice if you are starting to develop on the PanelPilotACE platform.